LANSING, Mich. – Gov. 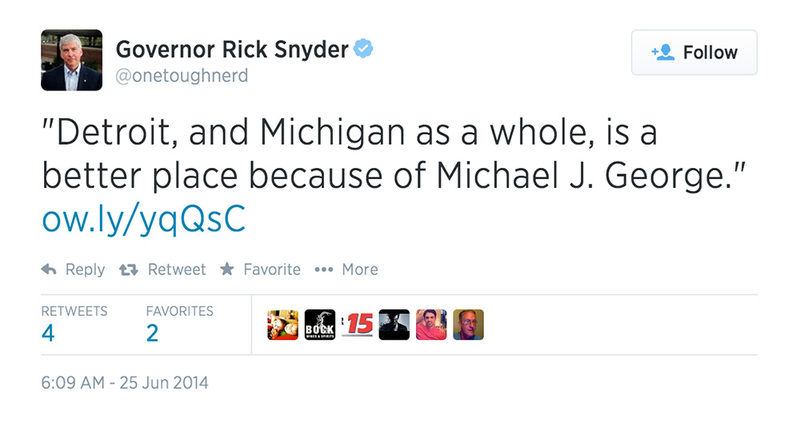 Rick Snyder offered the following statement following the passing of Michael J. George. “Michael J. George was a metro Detroit leader, known for his community and business leadership, but also for his warmth and kindness. “He is a classic Michigan and American success story, building a family business from a single milk route into the Melody Farms dairy business known to people across the region. He was a driving force in the formation of the First Bank of Michigan, focused on helping small businessmen grow and thrive. “But Mr. George also will be remembered for his embrace of the metro Detroit Chaldean community, including recent efforts to help thousands of minority Christians flee violence and persecution in the Middle East. “Detroit, and Michigan as a whole, is a better place because of Michael J. George and the people he inspired. Their success will be his legacy.